Pumpkin seeds in the shell contain about 285 calories per cup if they are dry-toasted in the oven, according to the U.S. Department of Agriculture. If they are roasted in oil, the calorie count goes up considerably. 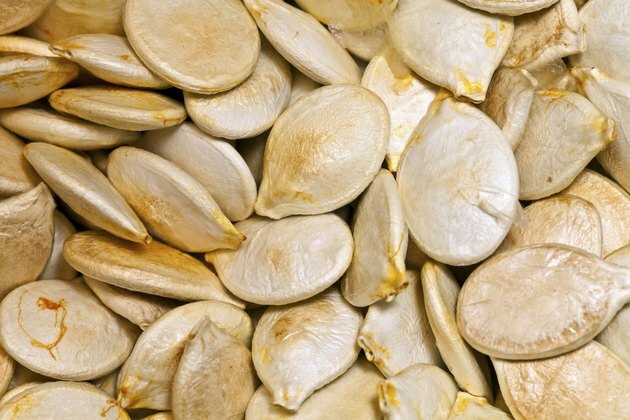 Pumpkin seeds in the shell contain 285 calories per cup. They also contain 12.42 g of fat and 11.87 g of protein, according to the U.S. Department of Agriculture. Pumpkin seeds that have been husked contain 721 calories per cup. That's because you a far greater number of kernels in a cup without the shells. If you roast pumpkin seeds in oil, expect much higher calorie counts. Typical recipes call for as much as 1 tbsp. of oil to 2 tbsp. of pumpkin seeds. Since 1 tbsp. of oil contains 124 calories, pumpkin seeds roasted in oil can contain as many as 992 calories per cup. Added to the calories in the unshelled pumpkin seeds, that comes to as much as 1,277 calories in a cup.